The Bhaktivedanta Center is in rural Virginia, not far from Charlottesville. In winter, we have practically 360 degree mountain views. It’s beautiful, and quiet—especially after it snows. 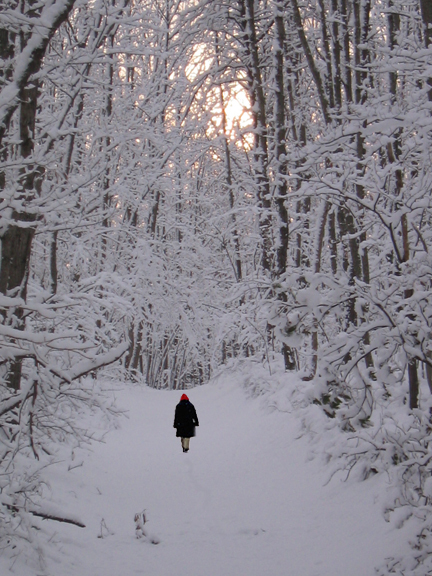 We take a japa walk during a deep snowfall, across the fields of the nearby farm, and into the woods. It’s quiet, save for the falling flakes of snow and the crunch of our steps. We marvel at the beauty of Krishna’s creation. Always changing, eternally fresh. Looking toward the sky, the flakes seem to spiral up to infinity, each falling alone, and yet part of the complete whole. The huge flakes rest on the arm of my dark jacket; I examine them. Each is crisp, beautiful, chiseled to perfection. Every flake individual, unlike the next…so beautiful, and yet, so temporary. Looking at the sculpted flakes, I think how ironic it is that something so beautiful, and perfect, will last only seconds. But then I am reminded of our own tentative position, of how quickly pass our individual lives—and how fragile they really are. Viewed in perspective, our time in each body is just like that of the snowflakes. We are tiny sparks of the Supreme perfection. Each jiva (soul) is an individual, housed in temporary form (in our case, these bodies). We have cycled through millions lives, each building on the successes and failures of the last. But we are still here, inside the cycle of birth, disease, old age, and ultimately, death. Why is this? What do we have to do to truly move on? What must we accomplish to cease being the melting snowflake on the coat of the material world? What will make us permanent? Complete? What is our perfection? 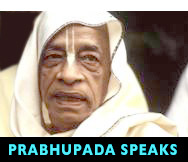 Prabhupada explains that the complete whole, the Personality of Godhead, Krishna, has immense potencies, all of which are complete in and of themselves. Thus this material world is also complete in itself. Everything this world needs to maintain itself has been supplied by Krishna and it functions on its own timetable set in motion by Krishna. Because we do not know that there is a complete arrangement in nature for our maintenance, we make efforts to utilize the resources of nature to create a so-called complete life of sense enjoyment. Because we cannot truly enjoy the life of the senses without them being dovetailed to the complete whole (Krishna) the misleading life of pursuing sense enjoyment is considered a life of “illusion.” The hand of a body is a complete unit only as long as it is attached to the complete body. If the hand is somehow separated from the body, it may appear like a hand, but it actually has none of the potencies (abilities) of a hand. Similarly, living beings are the energy of the Supreme, and if they are separated from the complete whole, Krishna, by their minds and actions, they cannot be fully satisfied. Prabhupada explains that the completeness of human life can only be realized when one engages in the service of the complete whole, Krishna. All the different types of service we can perform in this world—whether they be social, political, communal, international or even interplanetary—will remain incomplete until they are dovetailed with Krishna, the complete whole. When everything is dovetailed as service to the Supreme, then we also become complete. And we do not have to make a separate arrangement for our own pleasure because, just as watering the root of a tree satisfies all the parts of the tree, serving the Supreme is the most satisfying activity.